While I have stayed at the Holiday Inn Singapore Atrium previously, I checked-in at the property once again recently as I wanted to complete one of my Accelerate challenges for the final quarter (speaking of which, you should register for the Accelerate challenges next quarter). More importantly, I actually stayed here three years ago and I wanted to revisit it to have a more current review of this property - I also wanted to pig out at Zion Riverside Food Centre but that's a different story for another time. Click HERE to get the best rates for Holiday Inn Singapore Atrium! As I proceeded to the main check-in area of the lobby, I was quickly greeted by one of the most friendly (and genuine!) staff. Winnie then proceeded to check me in to the hotel and also proactively offered a late check-out time for being simply an IHG Rewards Club Gold Elite member. She also reminded me to register for the Accelerate challenges which I thought was a nice touch but I assured her that I was well-aware of these challenges and that they were one of the main reasons that I have chosen to stay at the Holiday Inn Singapore Atrium that weekend. 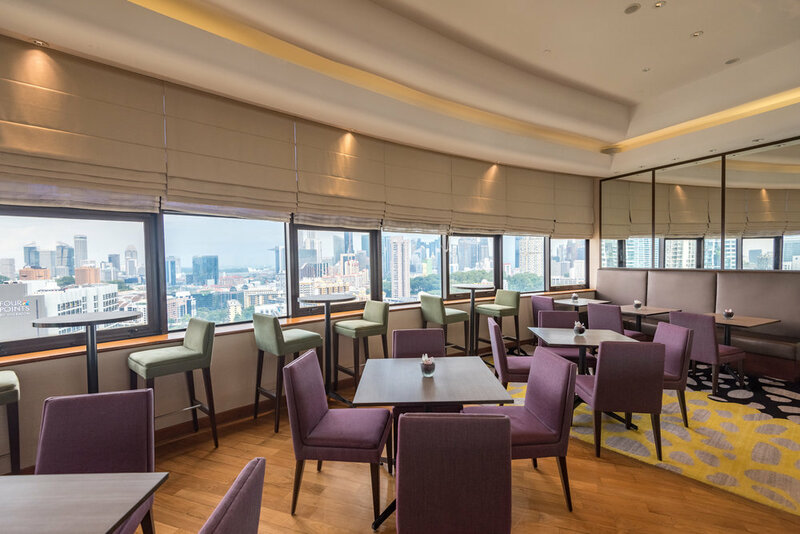 The Executive Rooms of the Holiday Inn Singapore Atrium are located on the top three floors of the hotel and they offer a pretty great view of the Singapore city skyline. The rooms in this room category have actually gone through some light refurbishments (the Deluxe Rooms actually look better but they do not have bathtubs) so it looks slightly newer but there is no argument that a major refresh would do the hotel some good. The rooms on the higher floors of the Holiday Inn Singapore Atrium do enjoy a pretty great view of the city and I would imagine the view from here on National Day to be fairly impressive (since you can see the Marina Bay in a distance). The Executive Rooms measure 30sqm in size and the bedroom may come with a twin, king-size or queen-size bed (at the same price) so make sure you pick carefully when you are making the reservation. There is a 32-inch flat screen television here in the room with a number of cable channels and you will also find a work desk by the side if you are here on business. Guests staying in Executive Rooms will also get to enjoy complimentary internet access in the room as well as in the Executive Lounge (more on this later!). I also received a plate of fresh fruits as well as some snacks as a welcome amenity but I was definitely not expecting this since I was only a IHG Rewards Club Gold Elite member during the stay. Nothing exceedingly fancy but definitely a nice touch considering how this is a Holiday Inn property (and they are not required to do so). While USB charging ports have not been installed into the wall (like most modern hotels), the Executive Rooms here at the Holiday Inn Singapore Atrium actually have a digital alarm clock by the side of the bed - there are two USB charging ports here that you may utilise. Two bottles of drinking water (complimentary) are provided each day but water in Singapore is potable so feel free to drink from the tap or boil it in the water kettle if you want to be extra safe. 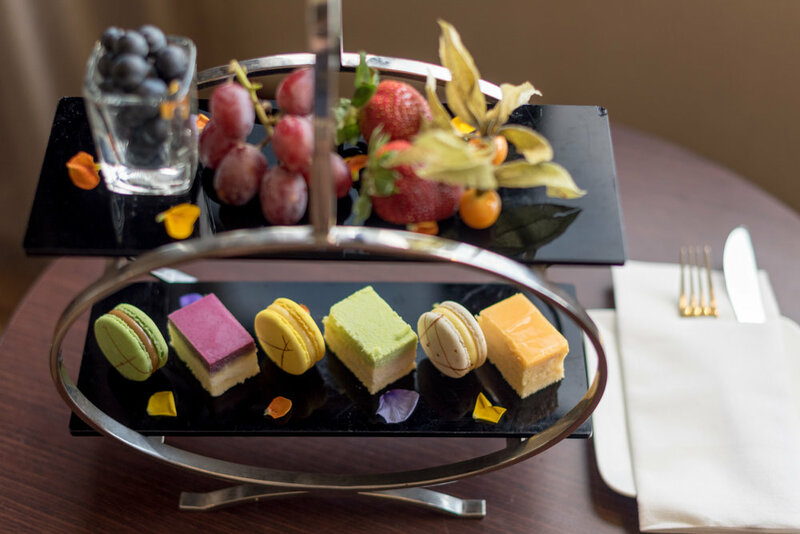 Teabags and freeze-dried coffee sachets are both provided here in the room but you are just a stone's throw away from various good cafes in the area. Do your palate a favour and head downstairs instead - instant coffee is disgusting. The bathroom of the Executive Room is typical of an older hotel in Singapore - you will find a shub (shower + tub) here but I actually like that they have retained this. A lot of the newer hotels (Andaz Singapore included) have decided to do away with the bathtub (which I personally do see value in) and it is nice that the Holiday Inn Singapore Atrium has decided to keep this in their Executive Rooms. Bath amenities are provided by an in-house branded one and I highly recommend for you to bring your own if you are picky - otherwise they are fine but don't expect the most luxurious smelling shower gels. The Executive Lounge of the Holiday Inn Singapore Atrium has been refreshed in recent years and it is looking a lot better - I love the bar stools by the window (perfect for solo travellers!) and I love how different seating configurations have been thought about to fully utilise this space. The colour scheme of the Executive Lounge is also a lot more pleasant and it does not remind me of the older lounge at all (and this is a good thing!). Evening cocktails and canapes are served in the Executive Lounge every day and this is only applicable to guests staying in a room or suite with Executive Lounge access - if your room does not come with access, make sure you check on any special rates that they may offer you while you are checking-in (it can sometimes be cheaper to pay for an upgrade upon checking-in!). There was a small selection of wines and spirits but considering how much a room here costs, it is actually pretty decent. The food is mediocre at best and I would highly recommend for you to check out nearby areas for food - Great World City and Robertson Quay are both only a short walk away. During your stay at the Holiday Inn Singapore Atrium, you will be able to take a photo of the hotel's iconic atrium. Shooting from top-down is easier since you do not have to worry about back light but if you are fairly confident with photography, shooting bottom-up may gain you some amazing results as well. Needless to say, the rooms on the higher floors could potentially give you a better shot. 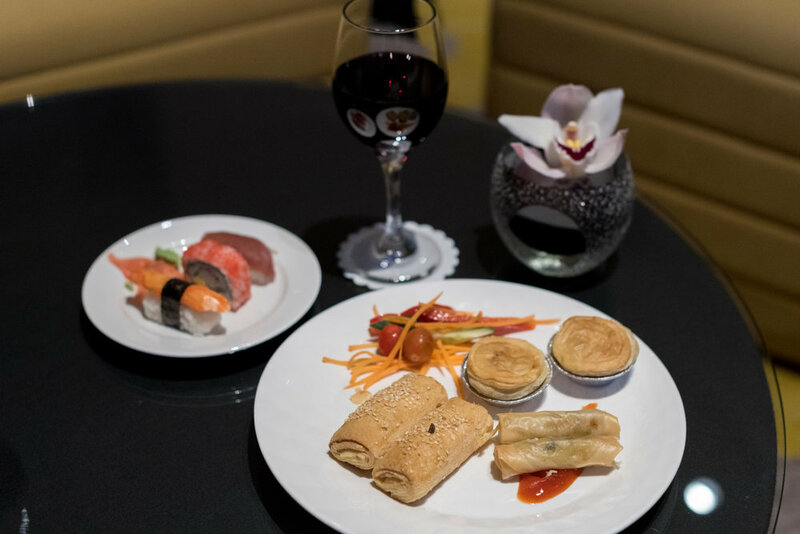 Since I have access to the Executive Lounge, I had the option of having breakfast at the lounge or enjoy a full buffet breakfast at the Atrium Restaurant - I decided to head downstairs for the full experience and boy was I glad. The Atrium Restaurant has been given a brand new look a couple of years back and it is looking a lot more modern - the food also surprised me in a good way! 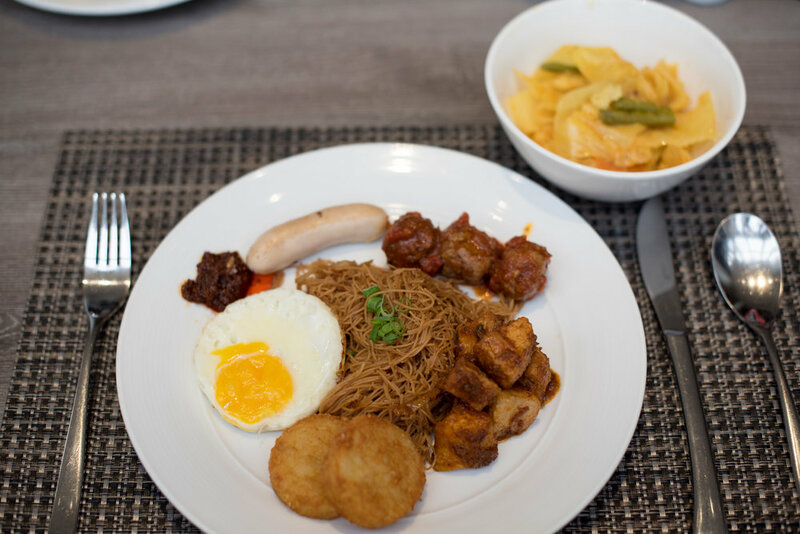 Do not expect to find anything fancy here for breakfast (this isn't the St. Regis or the Mandarin Oriental after all) but the local dishes are actually done pretty well. Besides, sayur lodeh for breakfast is probably one of the best things you can eat (if you love Asian food!). It is safe to say that the Holiday Inn Singapore Atrium isn't the most luxurious property around in Singapore, especially since we have had so many hotels that opened in 2017. With that being said, if you are looking for a decently-priced property where staff are happy and good at what they do, the Holiday Inn Singapore Atrium is a decent choice. There are some upcoming changes to the number of IHG Rewards Club points required for a free night in Singapore but thankfully the Holiday Inn Singapore Atrium is not one of them.